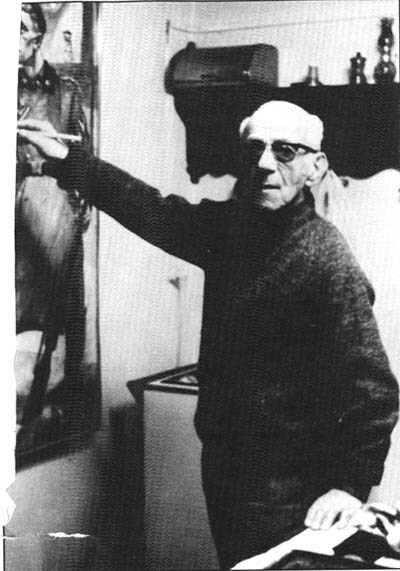 David Olère in 1982 in the kitchen of his house in Noisy le Grand, on one of his last canvases entitled “By way of the Zyklon-B gas chamber to the Nazi crematorium furnaces, Rabbis and Priests too”. This painting is 131 by 162 cm. In the center are a rabbi and a priest being beaten being beaten by an SS man. 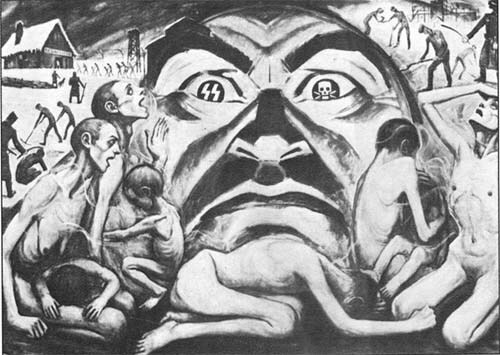 Upper left, Moll is firing on naked women on the edge of the incineration pits near Krematorium V. Upper right is Krematorium III in operation, with four prisoners passing in front of it carrying the soup. The curator of the PMO, K Smolen, confirmed to me that he had personally seen a similar episode, where rabbis and priests were ill treated by the SS. “Gassing” . A canvas of 125 cm by 190 cm composed of three scenes. Upper left is Bunker 2/V in winter, upper right Krematorium III under construction; in the center [according to David Olère] is the face of SS Georges, deformed by the peephole as he watches a gassing. The catalog of David Olère's sketches and paintings was published in 1989 by the Beate Klarsfeld Foundation, edited by Serge Klarsfeld. My own relations with David Olère were somewhat difficult, but as time went on, he began to realize that I had a very good knowledge of “his” universe. We were able to talk about it, and I took every opportunity to do so. But it was not without difficulty. Whenever I pointed out that what he was telling me was inexact, he would get angry and accuse me of calling him a “liar”. He had a cynical and acid humor, which was part of his defense against the memories that obsessed him. Through his works, he unwittingly helped me to understand the arrangement of the Krematorium and of Bunker 2/V. Having no news from Georges Wellers, I expanded my paper, which grew to 80 pages and received a different title: “Auschwitz;, peaceful architecture...” and became the first volume of a complete study of the Auschwitz Krematorien. On 13th March 1982, out of bravado and because I had cited him in my dedications, I telephoned Faurisson to announce the completion of my work on Krematorien IV and V. I was shocked and disgusted to find he had reached rock bottom, dragging his family down with him. A human wreck, hysterical, short of breath, panting, gasping out his reproaches, describing his “martyrdom”. But it has to be said that he had asked for it and well deserved it. Having sown the wind he had reaped a real whirlwind. What disgusted me was that he used his suffering to try and justify himself to me: “You can see that I was right, for the Jews are persecuting me!”. Trying to pass off his false coin wrapped in pity was the last trick of Herr Professor Doktor Robert Faurisson. Heavens, how the mighty are fallen! His last attempt to stop me from continuing my research was in vain. I gave the manuscript to Georges Wellers, and again waited. No reaction. He was sitting on my work, and it remained unexploited. While the traditional historians had no documents on Krematorien IV and V, I had brought him bucket loads. It was too novel. While they spoke of camouflage, I said there had been none, and had photographs to prove it. My work was too heretical. While they had only two documents indicating the probability of gas chambers in Krematorien II and III, I was giving them two documents from a civilian source proving their existence in Krematorium IV. It was all too revolutionary. While official history had established that the Krematorien had been specially designed as extermination instruments, I stated that they had been converted to this end. It was too revisionist. As time passed, the criticisms rained down. I lost patience. I contacted Professor Pierre Vidal-Naquet and said to him: “You wanted a second memory of Auschwitz. Well, I've written the first part”. At first he thought I was mad, then when I gave him the manuscript he saw that my proposal was serious. When he had read it, he considered that my demonstrations were valid and soundly-based, but that the text was poorly organized and not publishable in its present form. Which was quite true. But the documents that I presented were too important to remain unknown. He found a solution by arranging for me to take part in a Colloquium organized by the Ecole des Hautes Etudes en Sciences Sociales on the topic “Nazi Germany and the extermination of the Jews”, held at the Sorbonne from 29th June to 2nd July 1982 and chaired by Raymond Aron and Francois Furet. I was accepted as an “intervenant” rather than as a “participant” because of my very late candidature. Only a week earlier, I had known absolutely nothing about the venue or the people I was to speak before. Vidal-Naquet succeeded in launching me. I went to the Sorbonne early in the afternoon of 30th June. The speakers were respectively: Raul Hilberg on “The bureaucracy of annihilation”, Prof Dr Wolfgang Scheffler of Berlin on “Die Gaskammern” and Georges Wellers on the number of Jewish victims of the “Final Solution”. W Scheffler's communication, from which the Colloquium expected much, was not greatly appreciated by specialists on the topic, and they even regretted having brought him from Berlin because of the small amount of information he provided. He had not succeeded in properly exploiting the documents he had obtained in Moscow. Appearing just after Scheffler, I commented the projection of 36 slides showing the genesis and evolution of Krematorium IV and V at Birkenau, speaking for exactly eighteen minutes. I was the only speaker at the Colloquium to present good contemporary photographs. They came from the photograph album of the Auschwitz Bauleitung [Construction Management] that I had consulted at the PMO in April 1982. A copy of this album had just arrived at the Museum, sent by the Yad Vashem in Jerusalem, who had bought it from a German from Berlin, who in turn had obtained it shortly after the war from a Russian officer who had spent some time in Auschwitz. I had had the great pleasure, the album in my hands, of dictating to Tadeusz Iwaszko the captions of the photographs for the part concerned with the Birkenau Krematorien [Photo 38 is one example]. These unpublished photographs ensured the success of my intervention. Pierre Vidal-Naquet was delighted and called my exposé “clear and remarkable”. After the Colloquium, Georges Wellers considered that what had remained unused for a year now absolutely must be published after the summer holidays in the review of the CDJC “Le Monde Juif”. But since he was not in agreement with my theories as I challenged some of his, it was not easy to find common ground. At the end of August 1982, I went to the Struthof camp whose gas chamber had caused much ink to flow. I was not an ordinary tourist, having already studied the crematorium and the gas chamber thanks to the documents in the French legal archives. After visiting the crematorium and listening to the guide's commentary, I emerged furious, resolved to stop all my research and stop my publication for “Le Monde Juif”. There I was, preening myself about putting some order into Poland's “crematorium” affairs, but before going to make a clean sweep over there, it was necessary to put our own little house in order. I was beside myself with rage when I got to the gas chamber. We were hardly inside the building. When I attacked the guide, telling him a few facts about the gas chamber. Then he took the group round, keeping his eyes on me. Once his long-winded patter was over and the visitors had gone out, he closed the door and we remained alone. I then told him the whole history of the complex. The poor man, whose parents had been indirect witnesses of the gassings, did not know what to say, and concluded as I left that “Nobody has ever explained all that to me the way you have”.